Kate walks up the aisle Jump to media player Kate Middleton - wearing an ivory and white satin wedding dress and a tiara - walked up the aisle on the arm of her father, Michael. Kate and William exchange vows Jump to media player Prince William and Kate Middleton have made their vows to each other during their wedding ceremony at Westminster Abbey. 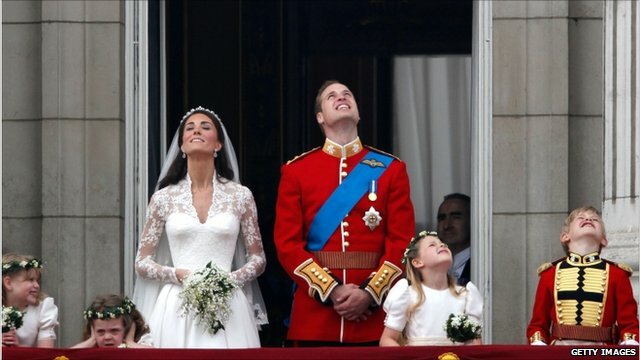 Highlights of the royal wedding Jump to media player Prince William and his newly titled bride, the Duchess of Cambridge, kiss on the balcony of Buckingham Palace, watched by thousands of cheering well-wishers. Newlyweds cheered by abbey crowd Jump to media player Prince William and Kate Middleton have been pronounced man and wife at Westminster Abbey. First kiss as husband and wife Jump to media player Prince William and his bride Kate Middleton have appeared on the balcony of Buckingham Palace. RAF flypast at Buckingham Palace Jump to media player RAF planes fly past Buckingham Palace as William and Kate kiss on the balcony. Kate's long walk up the aisle Jump to media player Kate Middleton - wearing an ivory and white satin wedding dress and a tiara - walked up the aisle on the arm of her father, Michael. Guests give their verdict on wedding Jump to media player Well-known guests at the royal wedding, including tv presenters and politicians, give their reaction to the event. 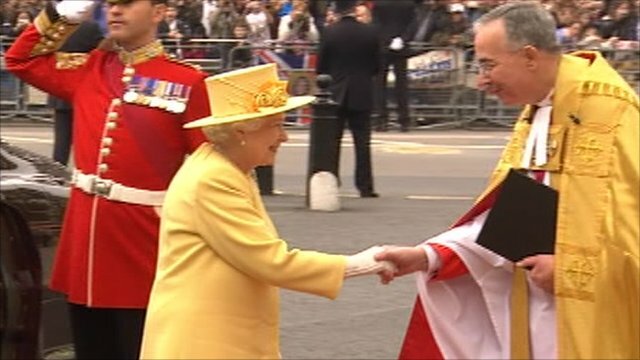 Queen arrives for grandson's wedding Jump to media player The Queen has arrived at Westminster Abbey for the wedding of her grandson Prince William. 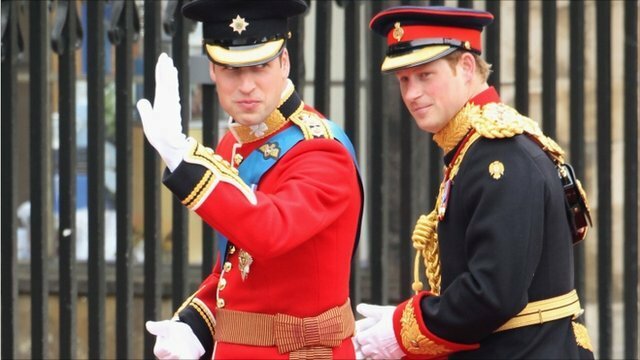 William leaves for Westminster Abbey Jump to media player Prince William has left Clarence House for the final time as a single man. Best man tips for Prince Harry Jump to media player BBC News invited comedians Lucy Porter, Arthur Smith, Miles Jupp and Hattie Hayridge to give their advice to Prince Harry about his traditional best man's duty. David and Victoria Beckham arrive at abbey Jump to media player David and Victoria Beckham were among the guests queuing outside Westminster Abbey ahead of the royal wedding ceremony. 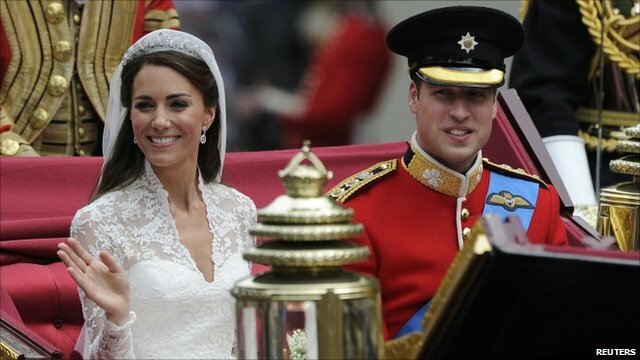 Prince William and Kate Middleton have been pronounced husband and wife at Westminster Abbey in London. Kate - wearing an ivory and white satin wedding dress and a tiara - walked up the aisle on the arm of her father, Michael.